VNA helps seniors live with dignity and independence at home. Since 1934, VNA has provided the highest quality care-in the home-across North Texas, especially for those with no place to turn and no means to pay. VNA was chartered as a nonprofit to address the need for home health care in the midst of the Depression. VNA is committed to providing the highest quality care to the elderly, frail, disabled, and dying and staff strive to keep patients and clients at home as comfortable, healthy, and independent as possible. Today, VNA offers Meals on Wheels in Dallas County, and VNA Hospice, Private Care and VNA Care Choices in 13 North Texas counties. VNA Meals on Wheels provides nutritious, hot, home-delivered meals to those who due to illness, advanced age or disability, are unable to provide or prepare their own meals. Last year, we provided 1,329,929 home-delivered meals to homebound seniors and disabled adults in Dallas County. Additionally, 1,200 neighbors received meals at senior centers. VNA Hospice Care provides medical care, as well as emotional and spiritual support, for adults in the final phase of a terminal illness and bereavement care for their families. Hospice Care is available in the following counties: Collin, Cooke, Dallas, Denton, Ellis, Henderson, Hunt, Kaufman, Navarro, Rockwall, Tarrant and Van Zandt. VNA Private Care provides individuals with the daily support needed to remain at home with a greater sense of comfort, control and security. Private Care is a safe and cost-effective alternative to a nursing home or assisted living facility. VNA Care Choices provides patients home-based palliative care support and symptom management while preserving treatment flexibility. The patient receives all the benefits of home hospice, without being forced to stop seeking curative treatment. VNA Care Choices is available in the same 13 counties as VNA Hospice Care and Private Care. Every other Tuesday, you'll find Kenny delivering for VNA Meals on Wheels. Now in his 9th year, Kenny drives 75 miles one way every other Tuesday just to deliver meals. He goes above and beyond, bringing clients water and extra homemade treats. Each treat has a special recipe-sugar and gluten free and made with extra love for each of his deliveries. 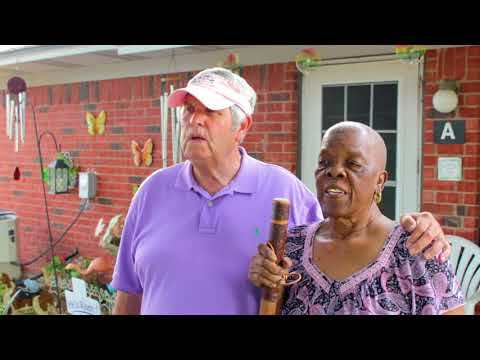 When Ms. Willie answers the door and sees Kenny, her face is beaming-with a large smile on her face, she hugs Kenny to thank him for the extras that he brings. "I love Kenny!" Ms. Willie says with excitement. "I look forward to seeing him. I wish I could see him every day!" Over the years, Kenny has developed a special bond with Ms. Willie and his clients. "I got involved with VNA because I didn't have much growing up, but we were always taught to give back. These clients are like my family. They need help and I'm here to give back," says Kenny. "Another one of my clients, Greg, struggled to get to the doctor for back problems. I walked in one day, and there he was laying on the floor. He said he couldn't make it to the doctor because he didn't have money for a taxi cab. That's not right. I told him to not cancel his appointments, I would personally take him. These people are like my family. They need help and I am here to give back." Kenny isn't just delivering a meal. He's delivering hope, he's delivering a smile to brighten someone's day, and he's delivering a lot of love. To learn how you can support VNA, like Kenny, visit www.vnatexas.org. VNA Hospice Care provides for hundreds of patients throughout North Texas every year. Most of our patients are eligible for Medicare and the excellent hospice coverage it provides. Some are not. VNA had 120 such cases last year, of patients who required community funding to pay for Hospice Care. VNA had the honor to provide care for John, a Hickory Creek Police Sergeant in his late 30s, husband and father of three. Too young by far to be eligible for Medicare, John never expected hospice coverage to be something he needed. He never expected the cancer that attacked him. He fought a losing battle against it for three years, fitting in endless treatments around his busy work schedule, staying on the job to help his wife support their young family. "He gave it a good fight," said his widow Amy. "He did chemo, then put on his uniform and went to work. He didn't want to miss a day." Eventually, he simply couldn't keep working. The day before Thanksgiving, his doctors told him there was nothing more they could do. From that point, his condition worsened rapidly, and within a few weeks, Amy knew she needed help to care for her husband. Thanks to your support, VNA was able to help. John spent the last weeks of his life with VNA Hospice Care, and was able to pass away with dignity, his family by his side at the end. "VNA Hospice Care was amazing," Amy said. "They took such a load off of me. I could concentrate on John and our family in the last days of his life. No words can describe how much it meant to me."